In a separate bowl, mix butter, 1/4 cup of jam, apple sauce, vanilla extract, eggs and salt. Whisk the dry ingredients and the wet ingredients together. Scoop a third of the batter into the waffle iron and cook roughly 4 minutes or until the waffle is light brown on both sides. Continue cooking util the batter is completely gone. 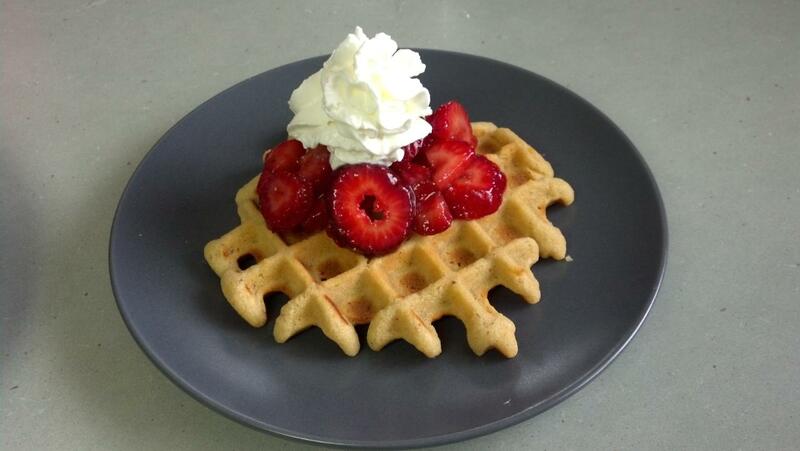 While the waffles are cooking, slice the strawberries and mix them with 2 tablespoons of jam. In another bowl whisk together the heavy cream, the remaining tablespoon of jam and the vanilla extract until the mixture holds its shape. Trainer Tips : If you want to reduce the fat use fresh strawberries and omit the heavy cream.